North Bay Nordic was pleased to welcome the Ontario Masters for this years championships. It was held on Feb 28-Mar 2. It was a dominating performance from Sara against a very strong women's field. She was the top female skier, overall, in all three races. The weekend began on Friday with a 10km classic race in pretty cold conditions. Sara(W3 category) won by 35 seconds against second skier Stephanie Rees(W2). Sara was able to pull away on the long climb from kilometer 3 to kilometer 7 and then stay away on the long downhill back to the stadium. Saturday was the 20km skate race which was the largest and most competitive race of the weekend. Sara once again used her strength and fitness to pull away on the relentless climbs in the first half of the race, in very difficult conditions, and then she rocked the long and challenging descents. She has traditionally been a bit cautious on downhills but the stiff competition this weekend spurred her to take some chances, which paid off. She won in 1:22:09, finishing a little over a minute ahead of Chris Huet(W5). Sunday's 10km skate race proved to be her biggest challenge and most impressive victory of the weekend. Sara was the only one of the top women who had raced both previous days and the 30km of racing was taking it's toll on her legs. Due the cold temperatures on Sunday morning the races were delayed by half an hour to allow for the temperature to rise to a balmy -20c and they changed the course to 3 shorter laps(with fewer hills) from 2 long laps(with many hills). This took away much of the climbing advantage that Sara usually "enjoys". To add even more adversity to her day, the women started 1 minute behind the second men's wave and the top women had to spend the entire race cutting a path through the stragglers. Sara lead most of the first two laps with Chris Huet and Jillian Flowers(W3) right on her tail. On the last significant climb of the race, Sara made her break only to trip over one of the slower men that she was passing as she crested the climb. The three women were all together again as they started the descent back to the stadium(not usually Sara strongest area). As the three of them circled the stadium and flew into the finishing straight they fanned out three a breast and the sprint was on. Sara looked strong, smooth and confident as she ignored her burning legs and powered across the line in 31:47.2, three tenths of a second ahead of Chris and seven tenths ahead of Jillian. It was pretty impressive to see all three of them battling to the line. I had a 2 minute head start on them and my vision had just barely cleared after crossing the line when I looked up to see them finishing. 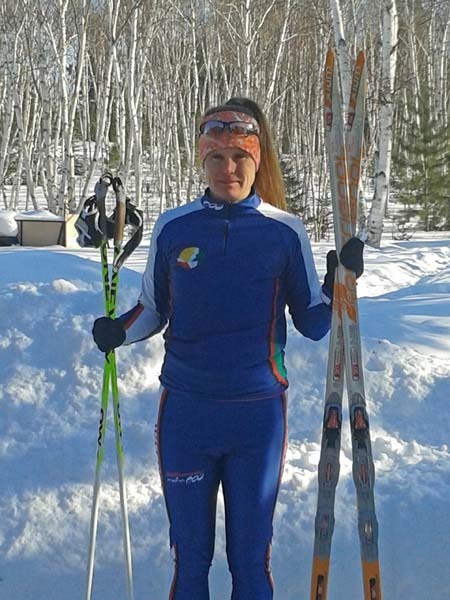 All of the hard work that Sara has put into her technique and strength over the last couple of years have really paid off and she is clearly the top Women's Masters skier in the province. Congratulations Sara!!!!!!!!!!! See the following links for complete results. Media Launch at Carl A. Nesbitt Public School with the "Running Team"
Students at the school helped kick off this year's Sudbury Rocks!!! Race, Run or Walk for Diabetes. Carl Nesbitt students Josh McKay and Maggie Parks will be lacing up for this year's Sudbury Rocks!!! 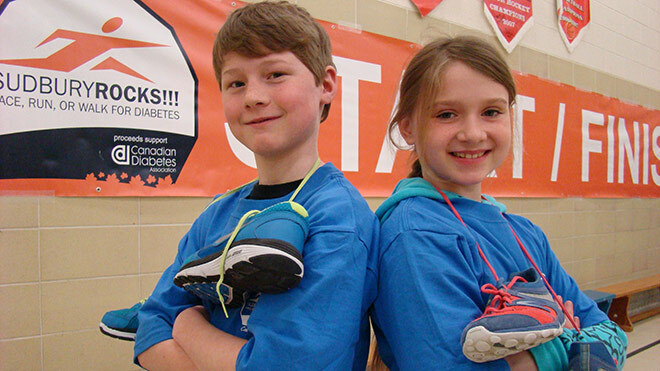 Race, Run or Walk for Diabetes on May 11. Photo by Heather Green-Oliver for Northern Life. 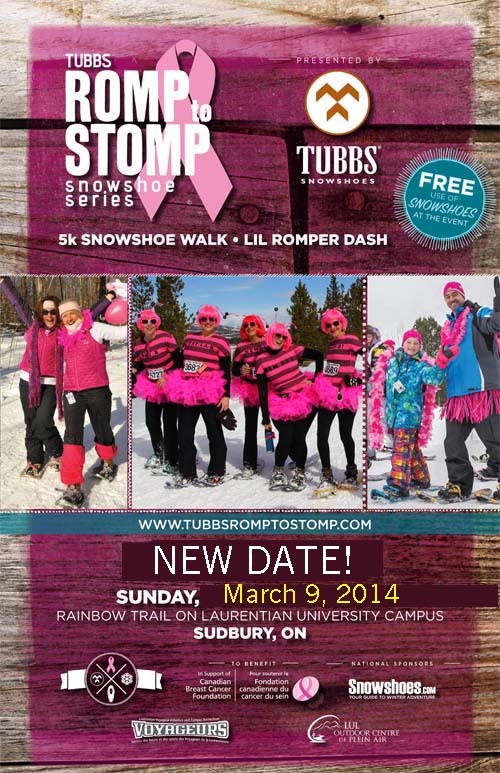 Sudbury’s annual charity marathon is going in a new direction this year, right past City Hall! For the third year in a row, Sudbury Rocks!!! Race, Run, Or Walk For Diabetes is being held on Mother’s Day, Sunday, May 11. Only this year, the event is being staged at Tom Davies Square, instead of the Centre For Life (YMCA Building) downtown. This year’s race expo is also being moved from the Centre For Life to École secondaire du Sacré-Coeur on Notre Dame Boulevard, Saturday, May 10, from 9:00 am to 5:00 pm. Sudbury Rocks!!! Race, Run, Or Walk For Diabetes was first held in 2006, and attracted 400 runners and participants. 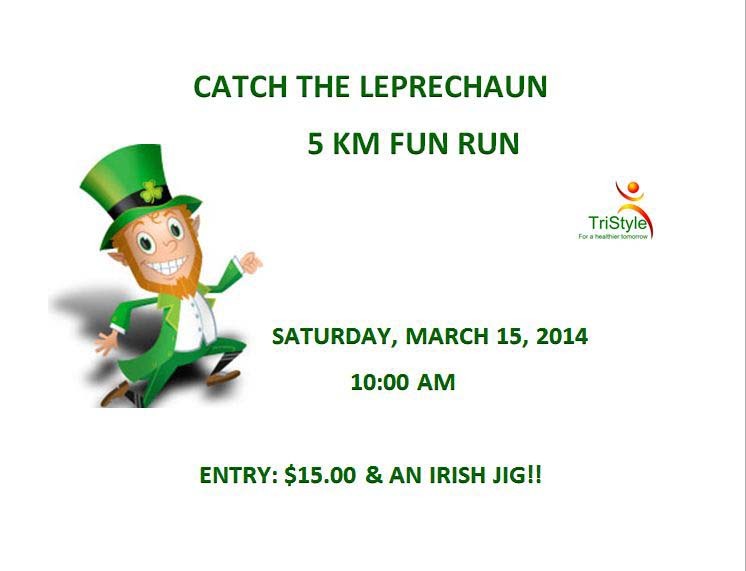 Since then, it has grown to become notheastern Ontario’s largest annual running event. In eight years, over 13,000 participants and 3,000 volunteers have taken part in the event. Sudbury Rocks!!! Race, Run, Or Walk For Diabetes features a 1 km children’s event, 5km and 10 km races, a 5km celebrity challenge, a half marathon, a marathon relay and a full marathon, which is an official qualifying event for the Boston Marathon. Funds raised by Sudbury Rocks!!! are used by the Canadian Diabetes Association for diabetes education and research in Greater Sudbury and northeastern Ontario. Since 2006, the event has raised over $350,000. It is estimated 9 million Canadians, including 15,000 people in Greater Sudbury, are living with diabetes and pre-diabetes. The SudburyRocks!!! and the Sudbury Running Room will be hosting a 10k clinic designed to prepare you for our 10k walk/runs on Sunday May 12, 2013. Rocks!! members Sara McIlraith and Vince Perdue will once again be your instructors. Spring clinics are begining this week, our 10K clinic started last night and the group is very excited to start training for the Sudbury Rocks! 10k race despite the less than ideal conditions outside. There is still lots of time to sign up and join the clinic ! Don't forget about our 5k clinic that is also training for the Sudbury Rocks race, they get going this thursday night at 6pm. This clinic is great for beginners or those who have been away from running and are looking to get back into it.